Nebraska’s tax code, which is approaching its 50th anniversary, is designed around a 20th century economy and lacks the flexibility to embrace the dynamism of the 21st. The state’s above-average individual income tax rates disadvantage individuals and pass-through businesses alike. Expansion of the sales tax base to include certain personal services could help pay down rate reductions, and further cuts could be phased in over time using “triggers” to ensure revenue stability. The Nebraska corporate income tax is characterized by high rates offset by substantial incentives for targeted industries. Policymakers could adopt a competitive single-rate corporate income tax by rolling back inefficient corporate tax credits, with possible further reductions subject to revenue triggers. Taxation of business equipment and other tangible personal property disincentivizes capital formation and imposes substantial compliance costs on Nebraska businesses. The state should consider approaches to reduce reliance on, or gradually phase out, tangible personal property taxes. Responsible tax reform would eliminate the “sticker shock” of the state’s high top marginal rates, enhance tax neutrality, maintain revenue stability, and give Nebraska a competitive edge. The revolution came to Nebraska in 1967. That was the year that Governor Norbert “Nobby” Tiemann remade the tax code with a program so sweeping that the noted political commentators Robert Novak and Rowland Evans exclaimed that Governor Tiemann was “pulling Nebraska out of the political Stone Age.” State property taxes and head taxes were out, while individual and corporate income taxes and the sales tax made their debut. The timing was auspicious. Voters had just taken to the polls to repeal the state property tax, the primary source of state tax revenue, confronting the new governor with a tremendous challenge but also a clean slate onto which he could impose his vision. The result was a major—and controversial—overhaul of state government finances, which one awed observer described as Tiemann dragging the state “kicking and screaming into the twentieth century.” Almost singlehandedly, Governor Tiemann gave Nebraska a tax code for the times. As we approach the 50th anniversary of those reforms, however, the time has come to reflect on whether that tax code from the 20th century is still appropriate for the 21st. A well-structured tax code strives for neutrality, simplicity, transparency, and stability. A neutral tax code—one that applies uniformly to similarly-situated taxpayers—has the flexibility to grow with a state’s economy. In practice, however, most states’ tax codes are designed around the economy as it existed at one time, or as policymakers hoped it would become. Targeted incentives provide attractive rates for select industries but necessitate higher rates on un-incentivized businesses. Expedients adopted for administrative simplicity in one era create unnecessary compliance costs in a later one. Predictability concerns, once modest, can loom large as the economy changes. The means of rewarding the economic drivers of yesterday can become the roadblocks to growth for the industries of tomorrow. Nebraska’s corporate income tax features high statutory tax rates with substantial offsetting incentives for select firms and industries. The state’s tangible personal property taxes are increasingly a throwback to an earlier era. The individual income tax fails to take advantage of streamlining advances adopted by other states in recent years. If Nobby Tiemann gave Nebraska a tax code for the 20th century, today’s policymakers have the opportunity to develop a growth-oriented tax code for the 21st. When Nebraska’s first individual income tax went into effect in 1968, replacing state property taxes as a primary source of revenue, the state was positioned as a decidedly late adopter. Only seven states have adopted individual income taxes since, yet in its relatively short history, the Nebraska individual income tax has gone through three distinct phases. Initially, rates were expressed as a percentage of federal income tax liability, initially set at 10 percent and peaking at 20 percent of federal liability. Rates changed 16 times between 1969 and 1986, sometimes midyear. For much of this period, rates were set by the Board of Equalization and Assessment based on standards and computations established in law. The second phase began in 1987, when the state adopted a four-bracket individual income tax with rates keyed to a “primary rate,” first of 3.15 percent and later 3.70 percent. Each of the four rates was calculated as a percentage of the primary rate, the ratios for each year established by statute. Seven sets of rates were imposed between 1987 and 2012. The most recent phase began in 2013, when the “primary rate” was set aside, with rates independent of each other and set by statute. Since 2013, the income tax has consisted of four brackets with a top marginal rate of 6.84 percent, with the top rate kicking in at $29,590 for single filers. All told, rates have changed 25 times in Nebraska since the income tax was first adopted in 1968—about once every two years—across three distinct systems, a surprisingly tumultuous history for a tax of such recent vintage. Two neighboring states—South Dakota and Wyoming—forego individual income taxes altogether. Another (Colorado) imposes a single-rate income tax, while Iowa, Kansas, and Missouri all impose graduated-rate taxes like Nebraska. Only Iowa imposes a higher top marginal rate (8.98 percent), and the burden of Iowa’s high rate is mitigated somewhat by the state’s atypical allowance of a deduction for federal income taxes paid. One of the last states to even impose an individual income tax, Nebraska now imposes one of the highest rates in the region. The state’s individual income tax code is also highly progressive, with taxpayers with federal adjusted gross income less than $50,000 incurring less than 10 percent of all liability. Structurally, Nebraska’s income taxes largely hew to the national average, having improved with the recent adoption of inflation indexing of brackets. This avoids a phenomenon known as “bracket creep” where progressively more income falls under higher brackets as time passes. Nevertheless, by virtue of the decisions of some neighboring states to levy a low, flat rate or to forego individual income taxes altogether, Nebraska faces stiff regional competition on the individual income tax component of our State Business Tax Climate Index, a comparative measure of tax structure. Source: Tax Foundation, 2016 State Business Tax Climate Index. Excessive taxes on income are generally less desirable than taxes on consumption because they discourage wealth creation. In a comprehensive review of international econometric tax studies, Arnold et al. (2011) found that individual income taxes are among the most detrimental to economic growth, outstripped only by corporate income taxes. The authors found that consumption and property taxes are the least harmful. The economic literature on graduated-rate income taxes is particularly unfavorable. The Arnold et al. study concluded that reductions in top marginal rates would be beneficial to long-term growth, and Mullen and Williams (1994) found that higher marginal tax rates reduce gross state product growth. This finding even adjusts for the overall tax burden of the state, lending credence to the precept of broad bases and low rates. On the margin, graduated-rate individual income taxes increase the cost of labor, as higher rates at higher levels of income reduce the incentive for employees to work additional hours or invest in efforts to seek a higher wage position. Consequently, complex, poorly-designed tax systems that extract an inordinate amount of tax revenue reduce both the quantity and quality of the labor pool. This is consistent with the findings of Wasylenko and McGuire (1985), who found that individual income taxes affect businesses indirectly by influencing the location decisions of individuals. Furthermore, because S corporations, partnerships, sole proprietorships, and limited liability corporations (LLCs) remit their income tax payments through the individual income tax, the individual income tax code matters to the majority of Nebraska businesses. These businesses, known as pass-through entities, pay the individual income tax in lieu of the corporate income tax because earnings “pass through” to the income tax form of the owners or shareholders rather than being remitted by the business entity itself. The explosive growth of pass-through businesses is a new phenomenon unanticipated by those who designed the 1967 tax code. Meanwhile, the individual income tax’s above-average rates cut into take-home pay and make the state less attractive for creating and retaining jobs. However unfairly, Midwestern states must often overcome geographic and cultural biases to land corporate relocations and attract top talent, making considerations like a competitive tax code all the more important. A modern individual income tax would recognize the impact of the tax on many of Nebraska’s small and midsized businesses, and seek greater simplicity and more competitive rates for all payers. A modern individual income tax might pay down rate reductions with a proportionate expansion of the sales tax base to include a broader range of services. Even though Nebraska’s sales tax, like its income tax, is less than half a century old, its design mimics the style—and the limitations—of those adopted in the 1930s. A base that includes most goods, to the exclusion of most services, is needlessly narrow and regressive, and will continue to erode over time as our economy becomes ever more service-oriented. Professor John Mikesell of Indiana University maintains a standard measure of sales tax breadth, defined as the ratio of the implicit sales tax base to state personal income. Neighboring South Dakota, which has implemented a very broad-based sales tax, has a breadth of 57.6 percent. Nebraska’s sales tax breadth, by contrast, stands at 33.1 percent, slightly below the national average. The South Dakota base, then, is 74 percent broader than Nebraska’s. Were the state to expand its sales tax base to even half of what South Dakota taxes but Nebraska exempts, the additional revenue could fund individual income tax reductions of nearly 30 percent. Should elected officials wish to provide income tax relief without fully offsetting revenue increases elsewhere, tax “triggers” offer a responsible way to reduce tax burdens as state revenues permit. Increasingly, states are relying on triggers to schedule tax cuts while assuring revenue stability. These trigger mechanisms permit tax cuts to be phased in over time, and only when revenue targets are met or exceeded. In recent years, triggers have played a part in tax reduction packages in states as diverse as Massachusetts, North Carolina, New Hampshire, West Virginia, Oregon, Virginia, and Missouri. Well-designed triggers set specific revenue targets or establish a statutory baseline year rather than relying on year-over-year percentage increases, which could allow a tax cut to move forward if the state makes up lost ground after an economic contraction. Under a responsible set of triggers, a series of rate reductions could proceed, incrementally, only after state revenues had risen by some margin above the cost of the tax cuts, or the percentage of the cost not covered by any offsetting expenditure cuts. This allows reductions to be paid for through commitments to slow the rate of government growth, and only permits the rate reductions to proceed when the additional revenue is in hand. Finally, as part of any individual income tax reform proposal, the legislature should consider reducing the number of rates and brackets, and instead focus on more effective ways to maintain the desired level of progressivity. Increasing the earned income tax credit and expanding the standard deduction or personal exemption credit is a more streamlined and effective way to accomplish the same goal. A 50 percent increase in the size of the state’s earned income tax credit would reduce revenue by an estimated $18 million in fiscal year 2017, while increasing Nebraska’s personal exemption credit from $131 to $150 would cost about $30 million. By consolidating brackets and lowering rates—paid for by offsetting sales tax base broadening, or phased in through the use of tax triggers—Nebraska can eliminate the “sticker shock” associated with its above-average income tax rates and offer a simpler, more competitive income tax code that positions the Cornhusker State for growth. Adopted simultaneously with the state’s individual income tax, the corporate income tax began as a single-rate tax of 2 percent of federal taxable income. A graduated-rate structure was introduced in 1975. The tax is currently levied at 5.58 percent on the first $100,000 in taxable income and 7.81 percent on all taxable income in excess of $100,000. These rates now exist independently in the code, but prior to 2013 were derived by computation, as 158 and 211 percent, respectively, of the then-“primary rate” of 3.7 percent. Forty-four states levy a corporate income tax, and of those, Nebraska is one of just 17 to adopt a graduated-rate system. 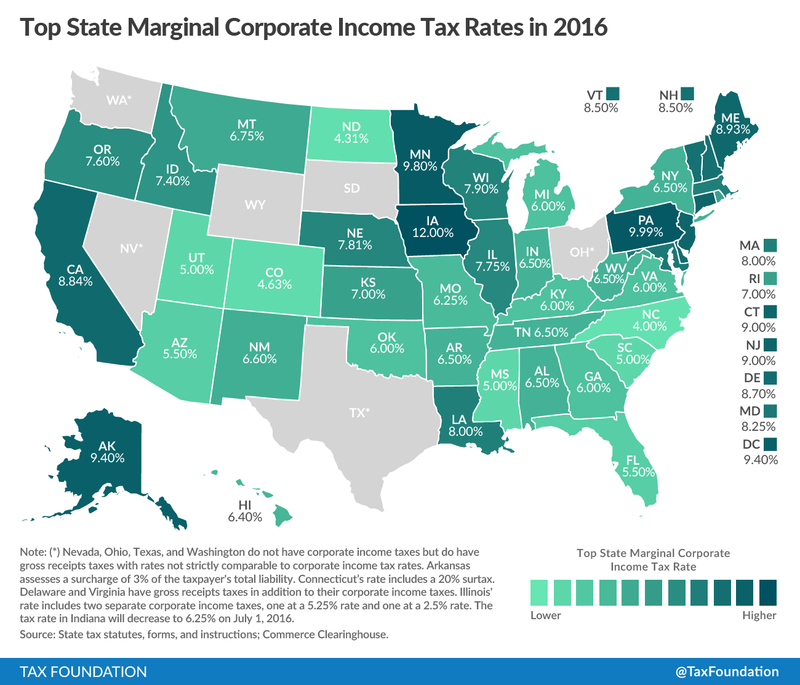 Two neighboring states, South Dakota and Wyoming, forego corporate income taxes altogether, while Colorado and Missouri impose single-rate corporate income taxes. Like Nebraska, both Iowa and Kansas levy graduated taxes on corporate income. Nebraska’s top marginal rate is the second highest in the region, behind only Iowa’s top rate of 12 percent, which is mitigated somewhat by the ability to deduct federal taxes paid. A single-rate system minimizes the incentive for firms to engage in expensive, counterproductive tax planning to mitigate the damage of higher marginal tax rates that some states levy as taxable income rises. Nebraska’s graduated-rate structure, by contrast, can encourage smaller C Corporations to engage in tax arbitrage, which is economically unproductive and introduces additional compliance costs. Structurally, Nebraska’s corporate income tax is somewhat worse than average, as it imposes above-average rates, ameliorated for some but not all businesses by generous tax incentives. Unlike individual income tax brackets, moreover, corporate income tax brackets are not indexed to inflation, meaning that over time, ever greater shares of corporate income will be subject to the top marginal rate. Nebraska is bordered by three of the best states in the nation on the corporate tax component of our State Business Tax Climate Index, a comparative measure of tax structure, and outscores only Iowa among its neighbors. Since 2008, 15 states and the District of Columbia have cut corporate income taxes, and Michigan shifted from a gross receipts tax to a traditional corporate income tax. In Nebraska, the corporate income tax has been increased 13 times and cut on six occasions since its introduction in 1968, with an overall trend of increases. Rates have remained unchanged since 1993. Reductions in corporate rates elsewhere reflect a trend toward decreased reliance on the highly volatile tax, which is imposed on an ever declining amount of taxable income. Furthermore, a number of states have undertaken efforts to simplify the tax structure by broadening the base and lowering the rate. Corporate income tax revenue is in decline across the country as more businesses choose to structure as S corporations and limited liability corporations (LLCs), single sales factor apportionment schemes become more common, and states give away more of their tax base in special credits and deductions. Corporate income taxes also tend to be complex and impose substantial administrative burdens for both payers and the government, and this complexity has not abated as the tax base has eroded. Finally, revenue volatility necessarily follows from the nature of the tax, since in periods of economic distress, many companies may post losses and thus lack exposure to a corporate income tax. While practically all revenue streams are cyclical, with collections lower during periods of economic distress, corporate income taxes experience particularly deep troughs. Property values may decline during a recession, but they are rarely wiped out, limiting how low property tax collections can go. Similarly, consumption patterns may decline, leading to lower sales tax revenues than when the economy is booming, but sales can only drop so far. Many companies’ net income, by contrast, can bottom out or even go into negative territory. As such, collections tend to be highly unstable, spiking sharply in good years and collapsing in bad ones. Like most states, Nebraska offers a range of deductions, exemptions, and credits against corporate income tax liability, substantially eroding the tax base. Incentives may sometimes appear effective, but they are not efficient. By lowering tax costs for targeted industries or rewarding particular business activities, they can yield higher employment or greater investment in those sectors. Unfortunately, the cost of these incentives must be borne by other, non-favored businesses which bear a correspondingly higher tax burden. Ultimately, incentives involve picking winners and losers, and seek to guide the economy in keeping with policymakers’ (often competing) visions. A well-structured tax code with a broader base—eliminating many of the incentives—and a lower rate would do far more to encourage job creation and economic growth. Sixteen states evaluated all of their major tax incentives, or at least undertook to do so, between 2007 and 2011, and between 2012 and 2014, ten states and the District of Columbia enacted legislation requiring regular evaluations of economic development tax incentives or improving existing evaluation procedures, according to the Pew Charitable Trusts’ Business Incentives Initiative. Adopting a metric from Pew, Nebraska’s Legislative Performance Audit Committee urges greater accountability for tax credits, recommending that they be evaluated against the principles of cause and effect (assessing which economic outcomes are actually attributable to tax incentives), budgetary trade-offs (considering the economic cost of higher taxes elsewhere in the system), and effects on non-incentivized industries (taking into account the degree to which growth in incentivized industries is offset by losses for non-incentivized businesses). Just these two major economic development incentives, the Nebraska Advantage Act and the Employment and Investment Growth Act, carve away more than a third of the state’s corporate income tax base while providing a questionable return on investment. Absent those two credits programs, a flat corporate income tax of 5 percent would have raised as much revenue in 2013 as the current two-rate tax with a top marginal rate of 7.81 percent on taxable income greater than $100,000. According to the state’s own analysis, these two credits alone—applied against the corporate income tax, the sales tax, and to a lesser extent the individual income tax—will increase the workforce by an estimated 2,014 jobs in 2016, but at a cost (against all taxes) of $154.3 million in credits earned. At $76,634 per job created, it is important to consider a significant counterfactual: how many jobs would be created if, instead of picking winners and losers through non-neutral tax treatment, the state used that $154.3 million to reduce rates? Incentive-heavy tax codes tend to ossify around a snapshot of the state’s economy, and can thus restrict the state’s ability to adapt to shifting economic trends. Dynamic economies are always in flux, the growth industries of tomorrow potentially bearing little relationship to the economic drivers of today. Systems which feature high statutory tax rates offset by reductions for select firms or industries make it unduly difficult for new industries to gain a foothold. Far from impeding economic growth, good tax structures grow with the economy. Using a reduction in tax incentives to pay down broad-based tax cuts would help position Nebraska for the future. Furthermore, as with the individual income tax, the use of tax triggers provides an attractive means of securing additional reductions to the corporate income tax over time and as revenue growth permits. Taken together, triggers and base broadening offer a path to a broader, lower, and potentially flat corporate income tax that would give Nebraska an important competitive advantage. Nebraska’s property taxes extend to both real and tangible personal property. Real property includes land, buildings, improvements, fixtures, minerals, and other property attached to the land itself, including rights and interests. Tangible personal property encompasses other physical objects, including business equipment—often colloquially defined as property that can be touched and moved. In Nebraska, household goods, motor vehicles, and livestock are exempt from the tangible personal property tax, rendering it primarily a tax on machinery and equipment (including agricultural equipment), trade fixtures, and even some software owned by businesses. Business inventory, however, is exempted, as is non-depreciable tangible personal property. The 1967 overhaul ended the taxation of intangible personal property (like stocks, bonds, and promissory notes) but left tangible personal property taxation in place. Six Midwestern states—Iowa, Illinois, Minnesota, North Dakota, Ohio, and South Dakota—currently exempt all or nearly all tangible personal property from taxation, while others, like Indiana and Michigan, have recently adopted reforms to reduce personal property tax burdens. As Creighton University economist Ernie Gross has observed, tangible personal property taxes reduce capital investment. In Nebraska, capital per worker is $78,371, compared to an average of $105,605 in neighboring states and $122,736 nationwide. In addition to the actual tax burden, tangible personal property taxes impose substantial compliance and administration costs because the tax levy is “taxpayer active.” This means that businesses must fill out forms identifying all of their personal property subject to taxation and detailing relevant attributes including, but not limited to, a physical description, the year of purchase, the purchase price, and any identifying information (e.g., serial numbers). The tax is to be remitted upon the depreciated value of each article of personal property. The direct and indirect costs of tangible personal property taxes have made such taxes a target for reduction or elimination in a growing number of states, as they are a barrier to economic growth. According to the Council on State Taxation, 45 percent of state and local business taxes remitted in Nebraska are property taxes, and a generous share of that total is due to personal property taxes. A direct tax on capital formation, tangible personal property taxes are also distortionary, as they apply to some business inputs but not to others. Taxes and machinery and equipment create incentives for mobile capital to flow out of high tax areas into low tax areas. The range of tangible personal property subject to taxation has been narrowed over the years through both legislative and judicial action. In 1991, business equipment was briefly excluded from the tax rolls, but restored through a constitutional amendment and enabling legislation in 1992. Under reforms in the 1970s and 1980s, inventory, livestock, and agricultural machinery were exempted from the tax base, with state aid to localities relied upon to offset reductions for the first decade. These reforms were important, but if Nebraska is to remain competitive, further efforts to reduce the impact of this distortive tax are appropriate. Fortunately, Nebraska policymakers have several options for tangible personal property tax reform. The state could gradually reduce reliance on tangible personal property taxes by increasing the de minimis exemption created by LB 259 in 2015, which exempts the first $10,000 in tangible personal property from taxation. Under this approach, the state might move to exempt the first $25,000, $50,000, or $100,000 of personal property from taxation, and not require businesses or individuals to file if the value falls below that threshold. Alternatively, Nebraska could promote greater tax competition within the state by enacting an option for localities to make these exemptions more generous or to repeal them outright within their borders. In the absence of a move toward statewide repeal, a local option, either standing alone or coupled with other reforms, would help reduce reliance on an antiquated tax without statutorily restricting local property tax bases. Since 2008, 16 states have cut their individual income taxes, while 15 states and the District of Columbia have reduced corporate income tax rates. States like Indiana, Michigan, and Ohio have recently undertaken personal property tax reforms. Nebraska need not break new ground; there are opportunities to learn from the experiences of other states. In 2011, Indiana embarked on several years of substantive tax reform, setting the corporate income tax on a phasedown path from 8.5 percent in 2011 to 4.9 percent by 2022; reducing the individual income tax from 3.4 percent to 3.23 percent by 2017; repealing the inheritance tax; and reforming tangible personal property taxes by permitting localities to exempt equipment newly placed into service and to adopt de minimis exemptions. Between fiscal year 2011 and fiscal year 2015, individual income tax collections increased from $4.6 billion to $5.2 billion, while corporate income tax collections rose from $626 million to $778 million. Two years later, North Carolina embarked on an ambitious tax reform effort which saw changes to individual income tax, corporate income tax, and sales tax, along with the repeal of the estate tax. The reforms, adopted over a series of years, replaced a graduated-rate individual income tax with a top rate of 7.75 percent, with a single-rate tax scheduled to fall to 5.499 percent in 2017, and are in the process of cutting the corporate income tax from 6.9 percent to 3.0 percent. Modest sales tax expansion to include a limited number of services provided offsetting revenue for some of the income tax reductions, while others are being phased in over time using revenue triggers. Between fiscal year 2013 and fiscal year 2015, state tax collections increased from $22.7 billion to $24.0 billion. Conversely, tax changes undertaken in Kansas offer a cautionary tale. Unlike Indiana and North Carolina, which phased in tax cuts in line with revenue availability, Kansas adopted sweeping tax cuts without offsetting spending cuts or revenue increases elsewhere, and absent the use of triggers to ensure revenue stability. Moreover, in a break with the principle of neutrality, the state carved pass-through income out of the individual income tax base entirely, creating substantial opportunities for tax arbitrage and confounding the state’s efforts to make reliable revenue projections. It is fitting that, with the approaching 50th anniversary of Nebraska’s 20th century tax code, policymakers engage in a conversation about how to keep the state competitively positioned in the 21st. Outmoded tangible personal property taxes and high statutory top individual and corporate income tax rates introduce needless complexity and create “sticker shock,” which places the state at a competitive disadvantage. Businesses and individuals are more mobile than ever, and while taxes are only one of the many factors that individuals and businesses consider in making location decisions, a competitive tax environment can help a state stand out. There is a responsible approach to tax reform in Nebraska—reform that reduces topline corporate and individual income tax rates, enhances tax neutrality by rolling back corporate tax credits, increases the equity of the sale tax by broadening the base to include select services, and reduces reliance on tangible personal property taxes. By relying on offsets and triggers, policymakers can ensure revenue stability while giving the state a competitive edge. That would be a worthwhile legacy for many years to come. Frederick Luebke, “Tiemann, Taxes, and the Centennial Legislature of 1967: Beginning Nebraska’s Second Century,” Nebraska History 71 (1990), http://www.nebraskahistory.org/publish/publicat/history/full-text/1990-Tiemann_Taxes.pdf, 107. Nebraska Department of Revenue, “History of Nebraska Income Tax and Sales Tax Rates Through 1992,” Apr. 1998, http://www.revenue.nebraska.gov/research/chronology/history.pdf. Don Walton, “Norbert Tiemann Remembered as Dynamic State Leader,” Lincoln Journal Star, June 20, 2012, http://journalstar.com/news/local/govt-and-politics/norbert-tiemann-remembered-as-dynamic-state-leader/article_85353521-69d6-5f9a-a564-27961f6fd757.html. A.L. (Roy) Frederick, “State Income Taxes in Nebraska,” Historical Materials from University of Nebraska-Lincoln Extension, Paper 918, Mar. 1992, http://digitalcommons.unl.edu/extensionhist/918, 2. Tax Foundation, “Dates of Adoption of Major State Taxes,” Jan. 1, 2005, https://taxfoundation.org/article/dates-adoption-major-state-taxes. Robert Miewald, ed., Nebraska Government and Politics (Lincoln: University of Nebraska Press, 1984), 156; Anderson v. Tiemann, 155 N.W.2d 322 (1967). Id., “Nebraska Tax Rate Chronologies: Table 1 – Income Tax and Sales Tax Rates,” Jan. 2016, http://www.revenue.nebraska.gov/research/chronology/4-607table1.pdf. Nicole Kaeding, “State Individual Income Tax Rates and Brackets for 2016,” Tax Foundation Fiscal Fact No. 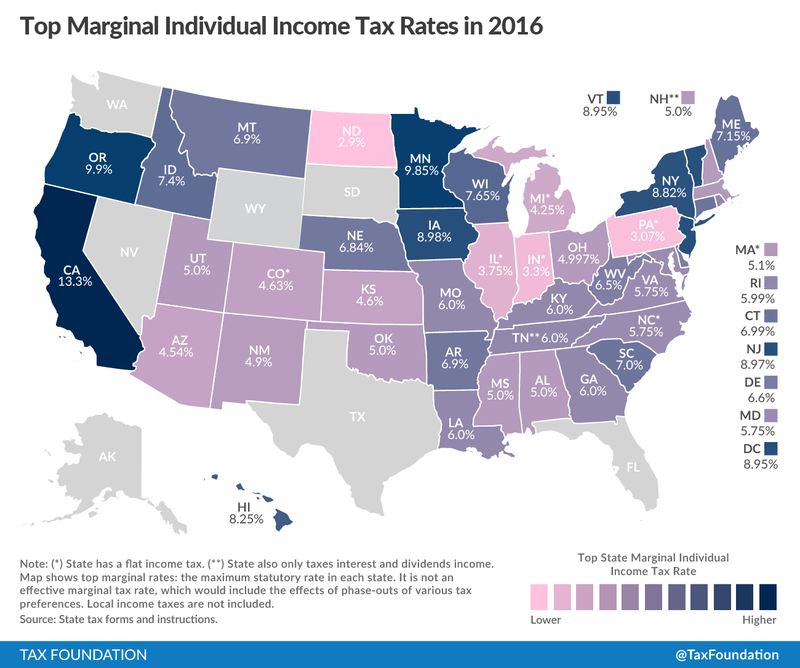 500, Feb. 8, 2016, https://taxfoundation.org/article/state-individual-income-tax-rates-and-brackets-2016, 4-7. Nebraska Department of Administrative Services, “State of Nebraska Comprehensive Annual Financial Report For the Year Ended June 30, 2015,” Dec. 17, 2015, http://www.auditors.nebraska.gov/APA_Reports/2015/SA100-12172015-July_1_2014_through_June_30_2015_CAFR.pdf, 155. Mary Jane Edson, “RE: LR 571 (Hadley) – An Examination of Individual and Corporate Income Taxes,” Nebraska Committee on Revenue Counsel Memo, Dec. 9, 2014, http://nebraskalegislature.gov/pdf/reports/committee/revenue/2014_lr571.pdf, 16. Jared Walczak, Scott Drenkard, and Joseph Henchman, 2016 State Business Tax Climate Index, Tax Foundation, Nov. 17, 2015, https://taxfoundation.org/article/2016-state-business-tax-climate-index . Jens Arnold, Bert Brys, Christopher Heady, Åsa Johannsson, Cyrille Schwellnus, & Laura Vartia, “Tax Policy for Economic Recovery and Growth,” The Economic Journal 121, No. 550, Feb. 2011. See, e.g., William McBride, “What is the Evidence on Taxes and Growth?” Tax Foundation Special Report No. 207, Dec. 18 2012, https://taxfoundation.org/article/what-evidence-taxes-and-growth. John Mullen and Martin Williams, “Marginal Tax Rates and State Economic Growth,” Regional Science and Urban Economics 24, No. 6, 1994. Therese McGuire & Michael Wasylenko, “Jobs and Taxes: The Effects of Business Climate on States’ Employment Growth Rates,” National Tax Journal, 38 (1985), 497–511. U.S. Census Bureau, “Nebraska,” 2014 County Business Patterns [table], http://www.census.gov/data/tables/2014/econ/cbp/legal-form-organization.html. Consistent with the consensus of public finance scholars, South Dakota’s sales tax includes a wide range of services. However, the tax is not limited to final consumer transactions, as most public finance scholars recommend, and includes a significant number of business inputs, leading to “tax pyramiding,” where the tax is embedded in the final price of goods and services several times over. A well-structured sales tax would extend to all final consumer transactions, whether goods or services, but exclude business-to-business transactions. John Mikesell, “State Retail Taxes in 2012: The Recovery Continues,” Tax Analysts Special Report, State Tax Notes, June 24, 2013, 1001. See, e.g., U.S. Census Bureau, 2013 Annual Survey of State Government Finances, https://www.census.gov/govs/state/. See, e.g., Jared Walczak, “Designing Tax Triggers: Lessons from the States,” Tax Foundation, forthcoming. Doug Gibbs, “LB 495 Fiscal Note,” Nebraska Legislative Fiscal Office, Feb. 25, 2015, http://www.nebraskalegislature.gov/FloorDocs/Current/PDF/FN/LB495_20150303-132452.pdf, 2. Note that Nebraska’s personal exemption is offered as a credit, not a deduction. A deduction allows a certain amount to be subtracted in the calculation of taxable income, whereas a credit allows a given amount to be subtracted from actual tax liability. Neb. Rev. Stat. §§ 77-2734.02 and 77-2701.01. Jeffrey Kwall, “The Repeal of Graduated Corporate Tax Rates,” Tax Notes (June 27, 2011): 1395. 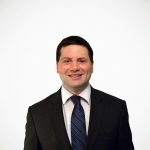 See, e.g., Joseph Henchman, “Trend #3: Corporate Tax Reductions, Top 10 State Tax Trends in Recession and Recovery, 2008 to 2012,” Tax Foundation, June 13, 2012, https://taxfoundation.org/article/trend-3-corporate-tax-reductions; Facts & Figures: How Does Your State Compare? Tax Foundation, multiple years. Pew Center on the States, Evidence Counts: Evaluation State Tax Incentives for Jobs and Growth, Apr. 2012, http://www.pewtrusts.org/~/media/assets/2012/04/12/pew_evaluating_state_tax_incentives_report.pdf, 17. Id., “Tax Incentives Programs,” Pew Charitable Trusts Brief, Jan. 2015, http://www.pewtrusts.org/~/media/assets/2015/01/statetaxincentivesbriefjanuary2015.pdf, 1. Stephanie Meese, Kathryn Gudmunson, and Martha Carter, “Measuring Success: Effectively Evaluating Nebraska Tax Incentive Programs,” Nebraska Legislative Audit Office Report, Nov. 2013, http://nebraskalegislature.gov/pdf/reports/audit/tax_incentive2013.pdf, 13-14. Nebraska Department of Revenue, “Nebraska Tax Incentives: 2014 Annual Report to the Nebraska Legislature,” July 15, 2015, http://www.revenue.nebraska.gov/incentiv/annrep/14an_rep/2014_incentives_annual_report_FINAL.pdf, 39, 121. Neb. Rev. Stat. § 77-105. 350 Neb. Admin. Code, ch. 20. Keisha Patent, “The Basics of Nebraska’s Property Tax,” Legislative Research Office, Jan. 2015, http://www.nebraskalegislature.gov/pdf/reports/research/proptax2015.pdf, 1. See., e.g., Joyce Errecart, Ed Gerrish, and Scott Drenkard, “States Moving Away from Taxes on Tangible Personal Property,” Tax Foundation Background Paper No. 63, Oct. 4, 2012, https://taxfoundation.org/article/states-moving-away-taxes-tangible-personal-property; Scott Drenkard, “Indiana House and Senate Pass Business Personal Property Tax Reform,” Tax Foundation Tax Policy Blog, Jan. 31, 2014, https://taxfoundation.org/blog/indiana-house-and-senate-pass-business-personal-property-tax-reform; https://taxfoundation.org/blog/michigan-approves-phaseout-destructive-personal-property-taxes; Joseph Henchman, “Michigan Approves Phaseout of Destructive Personal Property Taxes,” Tax Foundation Tax Policy Blog, Dec. 21, 2012, https://taxfoundation.org/blog/michigan-approves-phaseout-destructive-personal-property-taxes. Ernie Goss, “Nebraska Needs Both Property and Income Tax Reform,” Lincoln Journal-Star, Local View, Jan. 15, 2015, http://journalstar.com/news/opinion/editorial/columnists/local-view-nebraska-needs-both-property-and-income-tax-reform/article_4408477d-374b-59c7-845f-68254c9afb4e.html. Council on State Taxation and Ernst & Young, “Total State and Local Business Taxes: State-by-State Estimates for Fiscal Year 2014,” Oct. 2015, http://www.cost.org/WorkArea/DownloadAsset.aspx?id=91531, 10. Scott Drenkard, “Indiana’s 2014 Tax Package Continues State’s Pattern of Year-Over-Year Improvements,” Tax Foundation Fiscal Fact No. 425, Apr. 7, 2014, https://taxfoundation.org/article/indiana-s-2014-tax-package-continues-state-s-pattern-year-over-year-improvements; Joseph Henchman, “Indiana Approves Income Tax Reduction,” Tax Foundation Tax Policy Blog, May 14, 2013, https://taxfoundation.org/blog/indiana-approves-income-tax-reduction. See generally, Indiana Department of Revenue, “Annual Report 2015,” http://www.in.gov/dor/reference/files/dor-annual-report-fy-2015.pdf. Scott Drenkard, “North Carolina Proposal Builds on Landmark 2013 Reform,” Tax Foundation Fiscal Fact No. 470, June 15, 2015, https://taxfoundation.org/article/north-carolina-proposal-builds-landmark-2013-reform. See generally, Liz Malm, “North Carolina Illustrated: A Visual Guide to Tax Reform,” Tax Foundation, Nov. 5, 2015, https://taxfoundation.org/article/north-carolina-illustrated. See generally, North Carolina Office of the State Controller, Statewide Accounting Division, “North Carolina Comprehensive Annual Financial Report for the Fiscal Year Ended June 30, 2013,” http://www.ncosc.net/financial/13cafr/2013_Comprehensive_Annual_Financial_Report_bookmarks.pdf; Id., “North Carolina Annual Financial Report for the Fiscal Year Ended June 30, 2015,” http://www.ncosc.net/financial/15_cafr/2015_Comprehensive_Annual_Financial_Report.pdf. Scott Drenkard, “Kansas’ Pass-Through Carve-Out: a National Perspective,” Tax Foundation Testimony to the Kansas House Committee on Taxation, Mar. 15, 2016, https://taxfoundation.org/article/kansas-pass-through-carve-out-national-perspective.